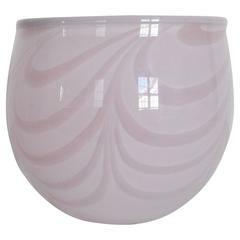 Decorative bowl by Kosta Boda, Sweden, circa 1970. Sweden’s oldest glass company, Kosta Boda, also enjoys a reputation as the country’s most artistic and experimental glassmaker. Since the late 19th century, Kosta Boda has hired painters, sculptors and other artists for short stints — generally two or three years — designing glassware, ensuring that the firm’s aesthetic is always lively and fresh. Two former army officers founded Kosta Boda in 1742 in Sweden’s densely forested Småland province. (Plentiful timber was needed as fuel for the melting furnaces.) 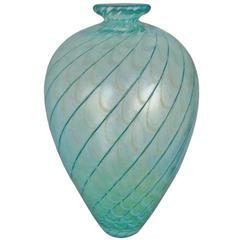 The glassworks’ early products consisted of everyday glassware, such as drinking vessels and windowpanes. As the company recruited master craftsmen from Bohemia, it created fine crystal for an aristocratic clientele. Kosta Boda began making art glass — that is, unique and limited edition pieces — with the hiring of the painter Gunnar Wennerberg in 1898. Wennerberg worked in the Art Nouveau style and brought a lush, organic look to the company’s wares. He was followed to the firm by artists such as Edvin Ollers, who in the early- 20th century created rich geometric and abstract floral patterns that were engraved on clear crystal. Two post-war Kosta Boda designers stand foremost in the minds of collectors. One is Vicke Lindstrand, who excelled at a technique called cased glass, in which a vividly colored or patterned section of glass is surrounded by and seems to float within a clear crystal body. The other is Erik Höglund, who had an almost artisanal eye for glass shapes, and liked to produce glass that had a textured, warped look. As you will see from the many pieces available on these pages, Kosta Boda created works in an astonishing array of styles, with something to suit any taste. Decorative large vase by Kosta Boda, Sweden, circa 1990. Decorative faience bowl by Stig Lindberg, Sweden, circa 1950. Very good condition. Decorative ashtray or bowl by Stig Lindberg, Sweden, circa 1950. The item comes from a group called Domino. Manufactured by Gustavsberg, Sweden. Decorative leaf shaped faience bowl by Stig Lindberg, Sweden, circa 1950. Gunnel Sahlin for Kosta Boda Atellier, Sweden. 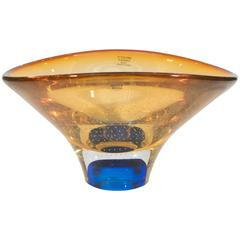 Yellow bowl in art glass decorated with orange spiral. 1994. In perfect condition. Measures: 10.5 x 3.5 cm. Signed and dated. Ulrica Hydman Vallien for Kosta Boda, Sweden. Bowl in blue mouth blown art glass. Swedish design 1980's. Measures: 9.5 x 4.5 cm. In perfect condition. Signed.